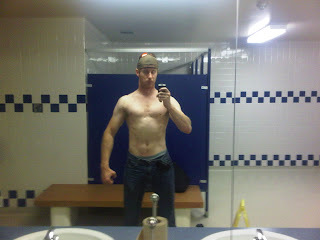 Rep to Failure - A MuscleHack Journey: THT 4.0 V1 - triceps done, shoulders done! So, as promised, yesterday was an epic double-up day for THT 4.0 Volume cycle #1. I started out with shoulders - and almost pulled an upper shoulder-blade muscle (the name escapes me right now). Not a trap but the ones directly on the shoulder blade. So, I still managed to get in two decent sets of overhead press and all of my lat raises for delts - with gains for delts! I rested for a bit, feeling myself out and decided to press on with triceps. 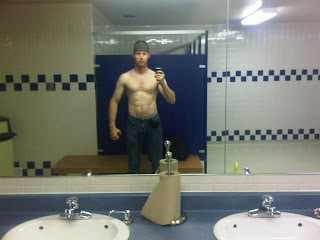 Instead of French curls, I've been doing overhead tricep extensions, two-handed, with dumbells. I progressed in every set yesterday. Trust me, I can feel it today! I also smashed out full progressions on tricep pushdowns! So, at the end of that week... I'm more than a little trashed. The good news is that as I write this, my shoulder feels decent so I might do 1-2 more overhead sets tonight to make up for it along with my legs. 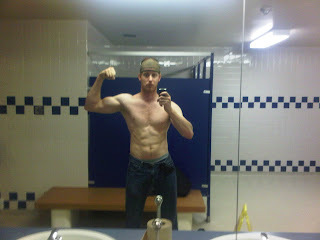 Suprise #1: I've been selected by Mark McManus to write for his new website, www.musclehacker.com. This is OUTSTANDING! Mark has created a new site for all of us to get together on and contribute our experiences, our modifications to the THT routines (like my overhead tricep extensions) and everything else that goes along with being a MuscleHacker! I've got my login info, but I'm waiting as to when we're told we can log-in. Surprise #2 - a fresh selection of pics from after yesterday's workout! I'm more than pleasantly surprised that I'm in this kind of shape with the last few weeks I've had. I'll take what I can get! Have a great week everyone! Train hard and lift smart! You can log in any time now, Adam! I'm... published? This is a surreal feeling, Mark! Thanks again for the opportunity!